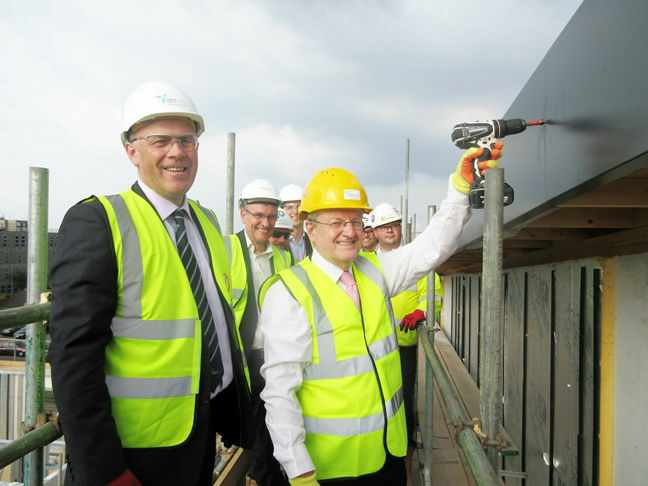 Construction group Interserve recently celebrated the ‘topping out’ of the Wallscourt Park Phase 2 student accommodation scheme on the University of the West of England’s (UWE Bristol) Frenchay Campus. Space for more than 550 beds are being created in five blocks in a mixture of town houses, apartments and studios, which will complement the previous phase of 396 beds arranged in townhouses completed by Interserve in 2014. The ‘topping out’ ceremony took place on the roof of Block C, a building of four storeys comprising 23 single bed studio flats, two of which are DDA compliant. William Marshall, pro vice-chancellor (Commercial Director and Corporation Secretary) at UWE Bristol screwed in some of the project’s final fixings with Paul Gale, divisional director, construction at Interserve. Marshall said: “This second major phase of our development will provide a high standard of accommodation which is important to our students, the University and the city. Our students want more campus-based accommodation so it’s important that we meet their needs and provide an excellent experience for them when they study at UWE Bristol. It creates a stronger campus experience at the University, complementing the other facilities currently under construction such as the new FBL building.